This Smith & Wesson Model 29 was manufactured in 1988 according to the company records. it is a six shot revolver that is chambered for the powerful .44 Magnum cartridge, but it can also easily accept the .44 special round. The Model 29 is built on S&W's large "N" frame platform which is smaller and lighter than the monster hand cannon "X" frame. This Model 29 is constructed of carbon steel and has a beautiful blued finish. It is a double action revolver with a barrel length of 6 inches(not 6 1/2) and weighs in right at 3 pounds without the scope. From the factory the revolver came with a serrated ramp with a 1/8" red insert front sight and a square notch rear sight that was adjustable for both windage and elevation. The rear sight has been removed and in its place a scope has been installed. The stainless version of this revolver is the Model 629. The Model 29 was introduced in December of 1955, but the first marked revolvers with the Model 29 designation is thought to have been released in 1958. Production continued until January of 1999. The last production Model 29 was sold on April 10, 1999 through the S&W company store in Springfield Ma. according to the 2006 book "Standard catalog of Smith & Wesson" by Jim Supica & Richard Nahas. Since 1999 S&W has, from time to time, produced some limited quantities of the Model 29. The Smith & Wesson company first began assigning model numbers in 1957. The version shown here is the Model 29-3. The model number of this Smith & Wesson revolver can by revealed by opening the cylinder, the model number will then be found stamped on the inside of the yoke. The dash number 3 at the end of the model number indicates the third round of engineering changes that were built into this revolver when compared with the original Model 29 design. This system was also used to indicate special configurations of a particular model. In 1982, the 29-3 version of the Model 29 was introduced which eliminated the cylinder counterbore. In handgun terminology, a counterbored cylinder would indicate that the cylinder is recessed around the case head so that the rimmed cartridges fit flush with the cylinder. The black rubberized grip panels shown here is not original to the firearm and was made by Pachmayr. If you decide to swap out the grips on your Model 29, hang onto to the originals as they are becoming quite collectible and valuable. While the .44 Magnum revolver was popular among shooters for many years after its introduction, it didn't gain notice by the general public until 1971, when Clint Eastwood's character Dirty Harry Callahan described the .44 Magnum as the most powerful handgun in the world in the film Dirty Harry. As it is so often the case with Hollywood, this statement by Dirty Harry was not entirely true. At the time there was a number of other powerful handguns such as the .454 Casull which was announced in 1959, and was available in custom revolvers. Whether the phrase from the movie is an accurate statement when it was made in 1971 is subjective to several factors such as overall terminal ballistics, external ballistics, or some combination of other factors. One thing the movie did do was to elevate the .44 Magnum to magical levels and after the movie's release, Smith & Wesson could not keep up with the demand for the Model 29. This skyrocket demand for the Model 29 far exceeded supply, and guns were selling for triple the normal retail price. I have been told that the handgun that was actually used for the filming of Dirty Harry was a .41 Magnum and not a .44 Magnum, but I have not substantiated that statement. There is actually a ton of rumors about the handgun that was used in that movie such as barrel size, just made for the movie from parts, and on and on. I will let the reader study them on their own rather then pursue them here as this page is just intended to showcase the S&W Model 29 and space is limited. The history of the Smith & Wesson company began in 1852 when Horace Smith and Daniel B. Wesson formed the Volcanic Repeating Arms Company. to manufacture a lever action pistol called the Volcanic pistol. A short while later the company came under financial difficulties and was sold to Oliver Winchester who at the time was a shirt manufacturer. In 1866, using the original lever action design created by Smith & Wesson, Winchester’s company emerged as the famous Winchester Repeating Arms Company. In 1856 Smith & Wesson formed a second partnership to produce a small revolver designed to fire the rimfire cartridge that they had patented in August of 1854. This revolver became the first successful fully self-contained cartridge revolver available in the world. Smith & Wesson secured the patents for the revolver which legally prevented other manufacturers from copying it. That patent along with the Civil war gave the young company a very lucrative business. The partners realized that the patent rights would not last forever so they went back to the drawing board and designed the Model 3 American in 1869. The Model 3 revolver was the first large caliber cartridge revolver and the success of this firearm established S&W as a leader in handgun manufacturing. The two most important customers for the new revolver were the United States Cavalry, which purchased 1,000 units for use on the Western Frontier, and the Russian Imperial Government that purchased 20,000 revolvers and paid S&W in advance with gold. Horace Smith retired from the company at the age of 65 and sold all of his shares to Douglas B. Wesson in 1875. The company went on to introduced a number of hammerless revolvers in the late 1800's that are still being manufactured today. S&W then introduced the Model 10 or as it was know then, the .38 Military & Police revolver which has been in continued production ever since. The Model 10 has been used by just about every police agency or military force in the world. In 1935 they came out with the worlds first magnum revolver. In 1955 the Model 39 was introduced which was the first American made double action auto-loading pistol. In 1955, the Model 29 which was chambered in .44 magnum was introduced. You might recall this revolver from the movie "Dirty Harry" with the actor Clint Eastwood. In 1965 the Model 60 was introduced that was the world’s first stainless steel revolver. In 1964, the company passed from the Wesson family control, and subsequently several conglomerates took control of it. Then from 1987 to 2001 a British company, Tomkins PLC, purchased Smith & Wesson for 112 million U.S. dollars. In March of 2000, Smith & Wesson signed an agreement with the Clinton Administration. The company agreed to numerous safety and design standards, as well as limits on the sale and distribution of their firearms. Numerous gun rights groups and individuals whom were already angry with such things as the assault weapons ban, responded to this agreement by initiating large scale boycotts of Smith & Wesson products. On May 11, 2001, Saf-T-Hammer Corporation acquired Smith & Wesson from Tomkins PLC for $15 million U.S. dollars, plus took on the $30 million dollar debt that had accumulated for a total purchase price of $45 million U.S. dollars. This was a fraction when compared to the $112 million originally paid by Tomkins PLC. Saf-T-Hammer purchased the company with the intention of incorporating its line of security products into all Smith & Wesson firearms in compliance with the 2000 agreement. The acquisition of Smith & Wesson was chiefly brokered by Saf-T-Hammer President Bob Scott, who had left Smith & Wesson in 1999 because of a disagreement with Tomkins’ policies. After the purchase, Scott became the president of Smith & Wesson to guide the 157-year-old company back to its former standing in the market. On February 15, 2002, the name of the newly formed entity between S&W and Saf-T-Hammer was called Smith & Wesson Holding Corporation. I have very briefly just touched on the many accomplishments and history of the Smith & Wesson company. These accomplishments which are so numerous that it would be literally impossible to understand the history of modern handguns without first understanding the history of Smith & Wesson. The description above really does not give S&W the pat on the back that the company so rightfully deserves. I do hope that it will give the reader some idea of what Smith & Wesson has done since becoming an industry leader back in 1852. Today, the company continues to lead the world with innovations that will take it, and the more then 1400 employees, solidly into the 21st century. The picture on the left is an inscription that is stamped on the right side of the frame. 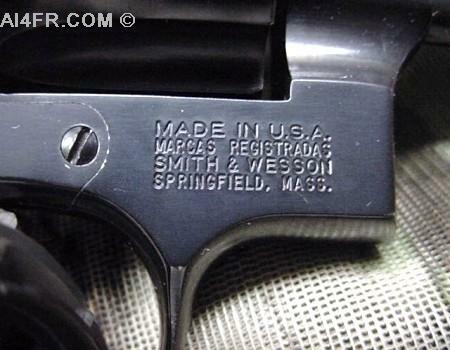 It reads as follows, "MADE IN U.S.A." and then underneath that is "MARCAS REGISTRADAS" , then below that is "SMITH & WESSON", and then on the bottom is SPRINGFIELD, MASS.". The first line indicates that the revolver was manufactured in the United States of America. The second line is a Spanish word meaning Trademark. 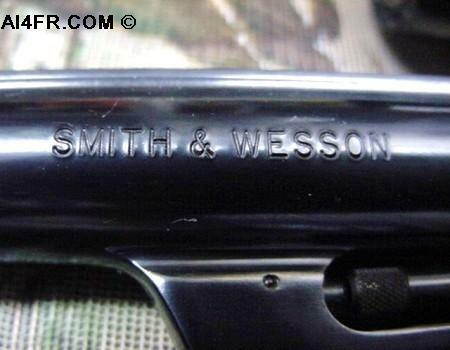 The third line identifies the manufacturer as Smith & Wesson, and the bottom line indicates the city and state the company is located in which is Springfield, Massachusetts. The photograph on the right is of the S&W logo that is also located on the right side of the receiver. 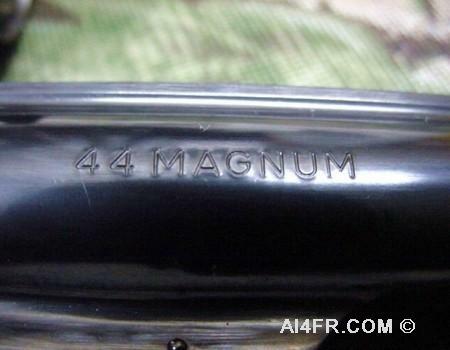 The photograph on the left is of the right side of the barrel which is stamped as follows, "44 MAGNUM". This marking indicates the caliber of the revolver. The photograph on the right is of the left side of the barrel which is stamped "SMITH & WESSON". 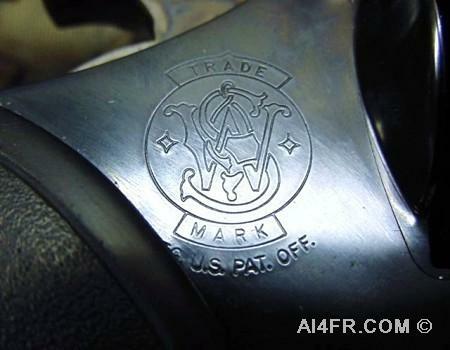 This mark identifies the manufacturer of the revolver. The photograph on the left is of the markings that are found on the top rear of the scope that is mounted on this revolver. 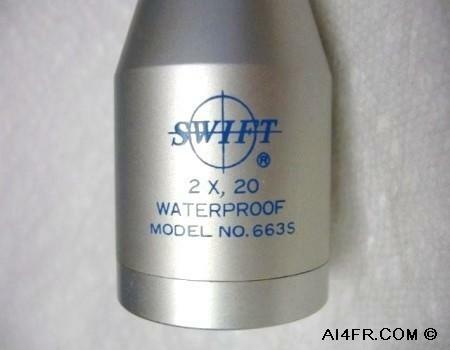 The Swift model 663S scope is a nitrogen filled, fog proof scope made from aluminum with an anodized silver finish. It utilizes a one inch in diameter single piece monobloc tube design that insures strength and is shock resistant. The scope incorporates a self centering Quadraplex, duplex reticle which makes it ideal for accurate and fast target acquisition. The scope has a 2 power magnification and a objective size of 20mm with a parallax focus distance of 50 yards and a 18 foot field of view at 100 yards. The eye relief is 13.3 inches. 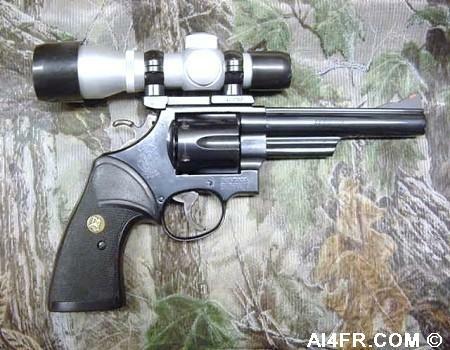 The length of the scope is 7.2 inches and it adds a weight of 8.4 ounces to the firearm. The model 663M is the same scope but with a matte finish. The picture on the right is of the Leupold manufacturer marking on the scope mount. 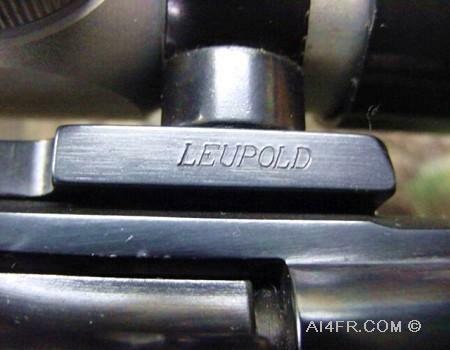 The Leupold company was founded by Mr. Markus Friedrich Leupold and his brother-in-law Mr. Adam Voelpel in 1907. At that time the company was called "Leupold & Voelpel". During this time the company specialized in the repair of survey equipment. In 1911 the company was renamed to "Leupold, Voelpel, and Company" after they were successful in the manufacture of a water level recorder that Mr. John C. Stevens had designed and patented. In fact, they made Mr. Stevens a partner in 1914. Then in 1942, the company was renamed to Leupold & Stevens. One day after the end of WWII, Mr. Leupold was out hunting deer with his rifle when his scope fogged up and he was unable to take the deer. It is said that Mr. Leupold yelled "Hell! I could build a better scope than this!" as the deer bounded off. If you're a hunter, then you probably can imagine that he said a little bit more then that. Be that as it may, the rest is now history as the Leupold brand name is in its fifth generation of ownership with sales of over 200 million dollars a year. Below is a brief description of the frame letters used for Smith & Wesson revolvers. The I frame was introduced in 1896 with the S&W Model 32 hand eject revolver. The I frame revolvers can be thought of as a typical 6 shot .32 caliber older revolver. The I frame was later enlarged slightly to accept the .38 special round and with the introduction of the Chief’s Special in .38 Special caliber it became the J frame in 1950. A typical 5 shot .38 special revolver can be thought of as a J frame. These J frame firearms are lightweight and easy-to-carry. The S&W Model 34 is a J frame revolver. The K frame was introduced in 1899 with the .38 Military and Police or Model 10 revolver. A typical 6 shot .38 special revolver can be thought of as a K frame. The K frames are good and popular workhorses for both duty and sporting use. The S&W Model 19 and the S&W Model 65 are K frame revolvers. The L frame is slightly larger then the K frame. If the K frame can be thought of as a medium size revolver, then the L frame would be thought of as medium-large. S&W lists both the K and L frame revolvers under the same category in the companies sales brochure. The L frame was announced in 1980 with four models, 581, 586, 681, and 686, all of which were chambered in .357 caliber. The idea behind the L frame was to design a handgun that was strong enough to withstand a steady diet of full-power .357 magnum ammunition while still being comfortable to carry for long periods. The K frames were a touch too lite for this while the N frames made carry difficult. The S&W Model 586 is a L frame revolver. Moving down in the world, the tiny M frame has only been used for the 7 shot .22 caliber Ladysmith revolver introduced in 1902. Moving up in the world, the N frame was introduced in 1908 with the Triple lock .44 special revolver. A typical 6 shot revolver in .44 or .45 caliber can be thought of as a N frame. Clint Eastwood used an N frame S&W Model 29 revolver in the movie Dirty Harry. 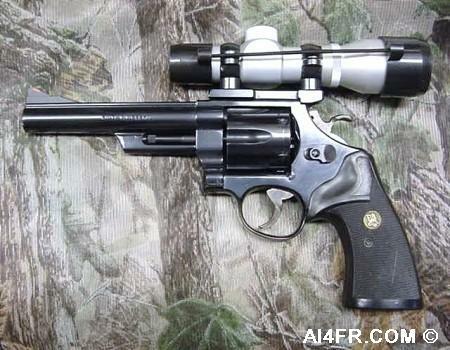 The N frame revolver is often used by hunters and competitive shooters. The revolver on this page is an N frame. When you hear folks speak of a hand cannon they might have be talking about the monster X frame revolver. For ultimate power and velocity there's nothing even close to an X frame. If you see Dirty Harry running the other way then he probably spotted an X frame revolver in the hands of a crook. A typical 5 shot revolver in .460 or .500 caliber can be thought of as a N frame.